An excellent tool to maximize the life of your chains & save you money. 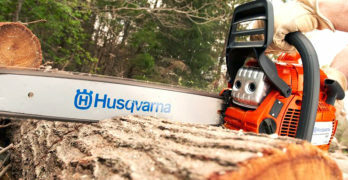 This article discusses much more than just the The Oregon 511AX chainsaw sharpener. We like to be thorough here at Chainsaw Journal, so settle in for a thorough overview on chain sharpening, specific chain grinders and even reviews of Oregon chainsaws for people who don’t want to sharpen their own chain manually. Do you remember the very first time you used your chainsaw? It’s a wonderful feeling when you are using a sharp chain, and you know it, because it feels like pushing a hot knife through butter. Eventually the ease of cutting through wood becomes more challenging if you wait too long to sharpen your chain — wait too long and the joy of cutting subsides as it will require a lot of effort to continue cutting wood. The bottom line is that cutting with a sharp chainsaw blade is absolutely essential for efficient cutting and your own personal safety. Let’s start by watching a video of the Oregon 511AX chainsaw grinding tool — one of the best chainsaw sharpeners available. This article covers the following chainsaw blade sharpeners: Oregon 511AX, Oregon 520-120, Oregon 620-120. I know that many homeowners hate the idea of sharpening their own chainsaw chain so I decided to cover three Oregon chainsaws that include their patented PowerSharp technology which is a built-in chain sharpener; allowing you to sharpen your chain by simply pulling a lever a few times. It’s impressive technology that saves a lot of time. Let’s face it, not everybody likes to tinker with their power tools. We think it’s important to know your options as consumers so you can make the smartest buying decision. You’ll Potentially Save Yourself From Harm. Jobs Won’t Take You As Long To Complete. You Will Save A Lot More Money. Chainsaws are powerful tools, so it would be unfair to claim using a sharp chainsaw will always be 100% safe. Still, you’ll be a lot safer if your chainsaw is as sharp as possible. When the teeth aren’t sharp, you’ll need to use a lot more pressure to cut through wood making it much harder to control, plus you’ll need to concentrate more on your balance at the same time. There is also more chance of a kickback throwing the blade in your direction. You already know you’ll need to apply more force, so it will make each job all the more difficult. Why put yourself through all that hassle when your life could be so much easier? It will also take you a lot longer to cut through all of your wood, and if you’re planning on working a lot on any given day the time difference could end up being quite substantial. Remember, your main goal should always be to feel like you’re slicing through butter. Although this is related to the last point we touched on, it’s still worth mentioning because it involves saving money. Imagine how much extra gas you’ll need to use over the course of a year if your chainsaw takes a lot longer to cut through everything. Even if you’re using an electric or battery-powered chainsaw, you’ll still need to use a lot more juice and your electric bills will increase. If you’re looking to save money a sharp chainsaw is a must. After every couple of drive links, you’ll have a saw tooth. You’ll always have a left-angled cutter followed by a right-angled cutter, which will help to keep the chainsaw straight when you’re cutting through anything. These teeth are going to become blunt after a certain amount of time, so you’ll have to keep them sharp by grinding them to help the chainsaw run as smoothly as possible. Luckily it’s a fairly effortless process, especially if you keep on top of things. There will also be a depth gauge sitting in front of every tooth, and they’re shaped like a shark fin. The reason they’re there is to control how deep your teeth can cut into the wood, which is for both the effectiveness of the chainsaw when cutting and your safety. As the teeth are worn down they will eventually end up level with the depth gauges, so you’ll also need to grind these down until they’re sitting at a level specified in your chainsaw’s user manual. When you look at a chainsaw grinder like the Oregon 511AX, you’ll see everything like the angle, length, and depth can all be preset depending on the particular chain you have. In other words, once you’ve locked in the correct angle for your grinder it’s going to guarantee you get it right. If you try to do the same thing with a simple chainsaw file, it’s going to be almost impossible to hit the correct angle every single time leading to all sorts of problems. Like we said, although professionals might be able to get it right it’s not easy for beginners. If you read about how to use a chainsaw file correctly, they’ll tell you to use an equal amount of strokes on each side. This is perhaps one of the most dangerous things you’ll ever read, because common sense says you won’t end up with the same results. Everyone will have a weaker side when they’re working with a hand tool, so your chainsaw teeth won’t be even. If one side is duller than the other, your chainsaw won’t be able to cut in a straight line. A chainsaw grinder completely eliminates this problem. Cutting through piles of wood is an enjoyable experience, but anything related to chainsaw maintenance isn’t. You’ll want to get the job done as quickly as possible while making sure everything is perfect, which can be done with a chainsaw grinder. Once you’ve set everything up and locked it all into position, it will simply be a case of sharpening and grinding down the various components of your chain until you end up with a chainsaw ready to get to work again. Now you know chainsaw files are not the best choice for beginners, but you might still be considering hiring outside help. Perhaps you already hire someone to sharpen your chainsaw at the moment. Think about all the money you’ll waste compared to buying a chainsaw grinder and doing the work yourself. Even though it might sound like a challenge, once you’ve read the user manual and you’re used to setting a grinder up it’s simple to use. They even come with built-in safety features to make sure you won’t get hurt. You’ll still have to wear gloves and safety glasses to minimize the risks as much as possible, but using a chainsaw grinder to sharpen your own chain will become as easy as changing a car tire once you’re used to it. As soon as you’ve used it once you’ll be able to make your way around the chain quickly until it’s as good as new. Please Note: Obviously there are some exceptions to the rule, and it will help to know about them to stop you from wasting your time. There will be occasions where your cutters will be damaged, which could happen if you try to cut through rocks and other debris. In those instances when you’ll not be able to fix the chainsaw on your own, you might need to call on a professional to solve the problem by replacing teeth or putting on a brand new chain. If you’ve finally decided to sharpen your chainsaw on your own, the last thing you’ll need to know is when you should sharpen your chainsaw. When you’re spending half the day cutting through wood you might be better sharpening it before you use it again, although that would be overkill if you’re only going to be using it for a short amount of time. You really need to sharpen it after you notice one of three things. As soon as you begin to see dust getting spat out instead of sharp chips, it’s obvious the cutters have lost their sharp edge. Also pay close attention to how difficult it is to cut through wood, because we’ve already said when you need to apply more pressure the teeth are dull. The final warning sign is when the blade is pulling in a certain direction, as your cutters will need to be sharpened to balance things out. To wait any longer after you notice these things means you’re putting yourself in danger. With a little experience, you should hopefully be able to sharpen your chain before you start to notice things going wrong. Oregon will soon be celebrating their 70th anniversary, and since their inception they’ve become one of the leading brands in the industry. What was once a small business with four employees has grown into a massive company with thousands of employees and products, all because they’ve constantly delivered unbelievable results for their customers. They are also constantly striving to innovate based on feedback, and today we’re going to look at some of the hugely popular chainsaw grinders they’ve released. Includes a wheel-dressing brick & a template for: depth-gauge setting, & wheel contour. Durable, long-lasting cast aluminum chassis. Variable motor grind angle to enable multiple adjustments. Safety shield with integrated light. 3-ft. cord with 3-prong grounded plug. Motor and Electrical Specifications: Single phase, 115V-Ac, 60 HZ, 3 amp, 285 watt, 3400 RPM direct-drive motor, .038 horsepower. Sharpens 1/4-Inch, .325-Inch, 3/8-Inch, 1/2-Inch, and 3/4-Inch pitch chains. The grinder comes with three grinding wheel with the thickness of 1/4-Inch, 1/8-Inch, and 3/16-Inch. Allows for equal grind angles without adjustment and new adjustment capabilities for accurate grinds as the wheel wears. Includes: Chain grinder, 3x Grinding wheels, Wheel dressing brick, Template for pitch, depth gauge setting and wheel contour. It’s easy to automatically assume the Oregon 511AX will be very heavy, but it only weighs a little under 19 pounds. That doesn’t mean it’s not a powerful machine, because the 3,400 RPM direct-drive motor will ensure you’ll be able to sharpen your chainsaw chain quicker than you ever could with a chainsaw file. The grinder is designed to sharpen all types of chainsaws, so if your chain is between a 1/4-inch pitch to 3/4-pitch you’ll be covered. The self-centering vice also clamps to all chain sizes giving you equal grind angles without needing to adjust anything. 115V-AC, 60 HZ, 285watt, 3400 RPM Direct Drive Motor. Your Oregon 511AX comes with three different grinding wheels, which are 1/4-inch, 1/8-inch, and 3/16-inch in thickness. You’ll still be able to adjust the grinding wheels once they’ve started to get worn down, which will allow you to end up with a properly ground chain every single time. To make things easier they’ve also added a vice sliding feature so you can keep the wheel in the same position as the material is reduced through usage, so once it’s set up for your chain you’ll have a lot less work to do. A template is included for the wheel contour, chain pitch, and depth gauge. In order to give you some extra room, you’ll also find the large indexing chain stop assembly will be able to accommodate bigger chains. The motor head release button was designed with the same intention in mind, so when you’re filing your depth gauges you’ll have more room to play around by pressing a button to lift the assembly head up. Lastly, it also comes with excellent safety features. There is a safety shield to protect you from sparks and flying debris, plus the built-in light will allow you to use the Oregon 511AX in less than ideal lighting conditions. ✓ View or download the guide on GRINDING ANGLES. ✓ View or download the SETUP INSTRUCTIONS for the 511AX. Newly engineered vise for improved performance on chains up to .404″ pitch. Sharpens 1/4″, 3/8″ low profile, 0.325″, full profile 3/8″, and .404″ pitch chain. Includes a dressing Brick, a quick check grinding template, and three grinding wheels for sharpening of 1/4″, 3/8″ Low profile, .325″, 3/8″ and .404″ pitch chain. Top plate and down angle settings. Self-centering chain vise and customizable vise handle positioning. The Oregon 520-120 is only a fraction heavier than the Oregon 511AX, and it also comes with a 3,400 RPM direct-drive motor. With 0.4 horsepower under the hood, it’s also slightly more powerful than the previous model. It’s been carefully constructed to sharpen more chain pitches, so the 520-120 will suit anyone who needs to go all the way up to a 0.404-inch pitch. Once again you’ll find a self-centering vice clamp allowing you to hit the same grind angles on every chainsaw tooth without needing to make any adjustments while you’re working. You’ll get three different grinding wheels in total, and the Oregon 520-120 also comes with a dressing brick. A lot of people see the dressing brick as an essential accessory when you’re sharpening chainsaw chains, because it will allow you to keep your wheels the correct shape and they’ll always be clean. Includes Safety shield with integrated light. It does have a grinding wheel wear adjustment feature, so you’ll still be able to sharpen your chain properly with a worn wheel without always needing to use the dressing brick, and making the necessary adjustments is easy to do. The other things it has in common with the Oregon 511AX are the indexing chain stop assembly and the motor head release button, so you’ll always have enough space to work and handle larger chains. The motor fan and T-shaped cooling fins will regulate the temperature for you to extend the life of the machine. There is also a template included to help you set up the correct wheel contour, depth gauge, and chain pitch. The same safety features come as standard too, including the safety shield with the integrated light. Main advantage — this model has hydraulic assist. Self-Centering Chain Vise. Hands-Free Clamp Vise. Hydraulic assist chain clamping vise. Includes a dressing Brick, a quick check grinding template and three grinding wheels for sharpening of 1/4″, 3/8″ Low profile, .325″, 3/8″ and .404″ pitch chain. I’m sure you noticed the Oregon 511AX and 520-120 models were almost identical, with the only big difference being the chain pitches they were able to accommodate. The Oregon 520-120 has a slightly wider range, because it could handle chain pitches up to 0.404-inches. It’s the same story with the Oregon 620-120, so it will handle the exact same chain pitches. You also get the fans, powerful direct-drive motor, safety shield with integrated light, easy-to-use controls, and an aluminum chassis built to last. It’s more or less the exact same except for one special feature. No doubt you’ll already know what it is by now, but in case you skimmed over the name it’s the built-in hydraulic assist. The chain vice will now close automatically, so you won’t have to bother locking and unlocking it as you make your way around the chain sharpening the teeth. As soon as you start lowering the motor and wheel, the hydraulic piston automatically starts compressing the chain vice. It’s one extra thing to make things a lot easier on yourself, and if you need to sharpen your chain a lot because your chainsaw is always in use it’s a feature you’ll begin to appreciate quickly. Make sure it’s clean: you obviously have to clean the saw chain before sharpening it, yet if you’re too keen to get started it’s easy to forget. Check for any damage: you’ll kick yourself if you sharpen most of the teeth only to discover there is one so badly damaged you’ll need to have it replaced. Identity the shortest tooth: all of your teeth will need to be the same size for your chainsaw to work correctly, so you’ll need to base everything of the shortest tooth. Increase the chain tension: you’ll find it much easier sharpening your chain after you’ve increased the tension, because it will reduce the chances of anything moving. Once you’ve removed all the metal shavings, lubricated the chain, and readjusted the chain tension back to normal after it’s been sharpened you’ll be ready to go. Just make sure you follow these steps whenever you’ve used your chainsaw, even if it wasn’t for very long, because it will reduce the chances of something going wrong. There is one major drawback when it comes to chainsaw sharpeners. You have to go through the process of sharpening your chainsaw once the cutters become dull, but what if you could skip that part altogether? Oregon have released PowerSharp chainsaws, and their patent-pending technology can’t be found anywhere else. We’ll take a closer look at some of their most popular chainsaws with the power to sharpen the chain on its own, but first let’s look at how the PowerSharp technology actually works. Pulling the red lever a few times automatically sharpens the chain. To begin with, you need to mount the sharpener onto the PowerSharp bar on your Oregon chainsaw. This is done by sliding steel pins through the twin guide holes, and it will ensure you end up with a perfect alignment between the cutters and the sharpening stone. The guidance drive links work in combination with the cutters and depth gauges to give your sharpener the stability it needs to do its job properly. The cutter to stone contact is kept flat at all times, because there is a diamond-coated dresser link that resurfaces the stone whenever necessary. Once your chainsaw is up and running, the chain will pass through the sharpener and when the cutters come into contact with the stone it will sharpen them until they’re as good as new again. The best part is, the entire process can be done on the job in a matter of seconds. 40% more power and torque than the previous model; the CS250. High-quality and powerful 40V battery-powered chainsaw with a brushless motor, an amazing self-sharpening system that sharpens your chain by the simple pull of a built-in lever. This model is an evolution of the CS250 which Amazon clearly states is “…approximately 40% more power and torque than the highly reviewed previous model; the CS250…” — which we discuss next in this article. 40V MAX* battery. Includes 4.0Ah Battery. Power never fades. Never slows down. It will stop when it needs recharging. Holds charge in storage for months. Battery fully charges in approximately 240 minutes. High power and fast cutting with 16″ bar. 40% more power and torque than the CS250. Just pull the trigger and you are ready to go with a long run time. No pull cords or warm up required. No more mixing gas and oil. Built In PowerSharp Sharpening System. Simply pull and activate the PowerSharp lever for 3-5 seconds. No tools required and saves on time. Four times quieter than a gas saw when in use. Unit Also Capable Of Accepting C750 Rapid Charger. ✓ View or download the MANUAL for the CS300-A6. ✓ View or download the SPEC SHEET for the CS300-A6. There is nothing better than a battery-powered chainsaw, especially when the 40V Max lithium ion battery is so effective. You don’t have to deal with any cables, plus because it’s not gas-powdered you don’t have any of the negatives like nasty fumes and keeping it topped up with gas. Ideal for light to medium-duty work around the yard. The battery in this particular model lasts up to 66% longer than smaller ones, and its technology means the power won’t fade out when you’re using it. If you don’t use your chainsaw often, it will also be capable of holding its charge for months. The brushless motor delivers high performance at the touch of a trigger with its instant start feature, and the guide bar sits at 16-inches long meaning it’s good enough for almost any job unless you plan on cutting down enormous trees. 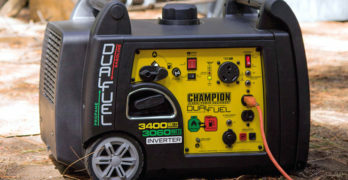 The entire chainsaw only weighs 12 pounds, including the 4.0Ah Battery Pack which takes around 210 minutes to charge. That will allow you to cut roughly 400 branches 2-3″ thick before it runs flat. Another nice bonus is the ability to adjust the chain tension without tools. Powerhead, Guide bar, Saw chain, Blade cover, Chain tensioning gear, Chain tensioning o-ring, Chain tensioning screw, Bar and chain oil. ✓ OREGON CS300-E6 : Includes a 2Ah battery and charger. ✓ OREGON CS300 : Chainsaw only. NO battery or charger included. No cords or fumes to worry about. Battery powered model. 40V MAX* Lithium Ion. 4Ah battery lasts for about an hour on a full charge. 14″ guide bar and chain. Battery power never fades. It stops when it’s out of power. No slow down. Maintains charge while in storage for months. Instant Start. Never have to worry about starting problems. Instant sharpening — from dull to sharp in as little as 3 seconds. Relatively quiet. 4 times quieter than a gas saw. Silent when you take your finger off the trigger button. Lightweight and balanced. Easy to use. ✓ View or download the MANUAL for the CS250. The Oregon CS250-A6 cordless chainsaw shares a lot of similarities with the Oregon CS300-A6. Its 4.0Ah Battery Pack also has a longer run-time nearly 66% more effective than smaller versions. This means you’ll still be able to cut through roughly 400 branches 2-3″ in diameter before it will need to be recharged, which should take approximately 210 minutes if it’s completely flat. Unfortunately you’ll have to use a tensioner tool to change the tension of the chain, because it doesn’t include the tool-free system. Battery indicator tells you when your battery needs a recharge. It’s not as good as the Oregon CS300-A6 due to one reason in particular, which is the length of the guide bar sitting at only 14-inches long. It might not be a negative depending on your needs, but it will only be able to cut through branches up to 12-inches thick. On the plus side, it still starts instantly at the touch of a trigger. It also has the same low noise production, so it won’t be very loud when in use and when you’re not cutting through anything you’ll hardly hear a thing. It also provides easy access to the chain for maintenance and cleaning. As with all battery-powered tools, you might want to consider purchasing an extra battery if you want to work for long periods of time. You can be constantly charging one battery while you work, ensuring limited down-time. Low-kickback chain per ANSI B175.1 & CSA Z62.3. Will power your chainsaw for about one hour. 40V MAX Lithium Ion battery. Power never fades while working. Maintains a charge in storage for months. Fully charged battery voltage measured without a workload is 40 volts. Nominal voltage (real-world) is 37. Battery-powered chainsaws are the most convenient type of chainsaws for a lot of reasons, including the fact that they are clean-burning, don’t pollute the environment, quiet, minimal maintenance, lightweight and easy to use. But, I will say the major drawback is the cost of the batteries and you’re ultimately limited by the amount of battery power you have. I think it’s a good idea to have an extra battery when buying a cordless chainsaw but this obviously adds to the overall cost of the purchase. Unfortunately, battery prices will be high for the foreseeable future so consider this when deciding on which type of chainsaw to buy, but for small jobs, battery power is perfect. And, if you need a lot of uninterrupted power then gas chainsaws can’t be beat. Yes, gas chainsaws are superior when it comes to power. minimal maintenance, low noise, silent between cuts & self-sharpening. View or download the MANUAL for the Oregon CS1500. You might not like the cord after reading about the cordless models, but at least the Oregon CS1500 won’t limit you to 400 branches. You’ll be able to cut through as many as you need until the job is done, and because it’s self-sharpening dull cutters can’t even stop you. 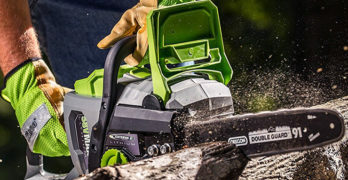 It also has a very powerful motor with a long 18-inch guide bar, which has been designed to reduce kickback to keep you as safe as possible when you’re using the chainsaw. This model also has a tool free tensioning system like the CS300-A6. Even though it’s not cordless and slightly more powerful, it contains a lot of features we’ve already mentioned. The noise is a big one, so just like the cordless models it’s quiet when in use and almost silent when it’s not cutting through something. You can also start it instantly with the pull of a trigger, although you’ll need to find a way to connect it to a power source before you use it. The other obvious difference is the extra weight that comes with a bigger guide bar, but it’s still less than 18 pounds so it’s not heavy. Visit Amazon to purchase the Oregon CS1500 or to learn more. Decisions…decisions : Is the Oregon 511AX right for you? Are you going to go with the Oregon 511AX so you can sharpen the chain on your own, or will you skip that altogether by opting for a self-sharpening chainsaw? If you already own a chainsaw it might be best to go with a chainsaw grinder, but if your current one is getting old it could be time for an upgrade. No matter which option you decide to go with, you won’t be able to go wrong because all Oregon products are excellent and their aftercare service is equally as impressive. Maybe the best thing to do would be to read all the reviews on Amazon. They’re all popular products and lots of people are using them, so it’s always good to let them guide you in making a decision. After all, before you buy anything it’s always a good idea to do your homework. Let’s just hope it doesn’t make things more difficult for you, because all the products will have glowing reviews. Hopefully you’ll already have a good idea what you’re looking for. Learn more OREGON products by visiting their website.